Every year or so, we like to use regression to the mean analysis to forecast the future of the Tallahassee real estate market. In case you have never heard of this concept before, regression to the mean is a mathematical or statistical phrase used to explain the fact that things have a tendency to return to normal over time. Specifically, it refers to the tendency of a random variable that is highly distinct from the norm to return to "normal." So in real estate, this concept means that no matter how good or how bad the real estate market gets, we know that over time it will "return to normal." 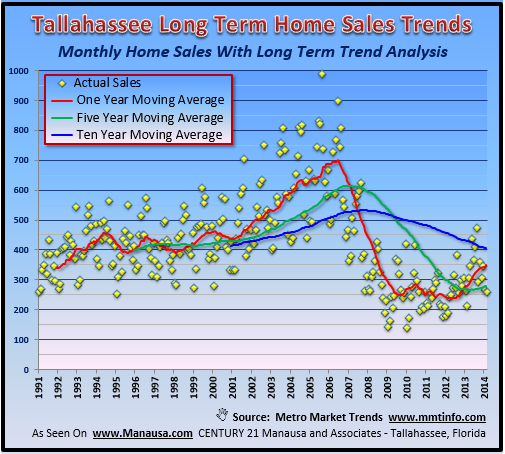 So what exactly is normal for the Tallahassee real estate market? Imagine if we graphed the average number of homes sold each month over the last 500 years, what would that look like? How about the last 100 years? Fifty? I suspect the average of all three would be a line heading higher. Why? Because the population of Tallahassee has grown just about every year during all of those frames. Of course, we don't have much information for those time frames, but we do have data for home sales in Tallahassee since 1991. In the real estate graph above, the gold diamonds record the number of homes sold each month since January 1991. Trend lines (averages) are then created with that information. The red line shows the one-year average number of homes sold each month, meaning any point on the red line indicates the average number of monthly home sales over the past 12 months. The green line measures the five year trend in a similar manner, and the blue line measures the ten year average. Over the past five years, there were 280 homes sold each month in Tallahassee (normal for the past 60 months was 280). Over the past ten years, there were 400 homes sold each month in Tallahassee (normal for the past 120 months was 400). So, if you were to ask me how many homes sell in Tallahassee each month, my answer could be somewhere between 280 and 400, right? Right now, our short term trend and medium term trend are on the rise, meaning the Tallahassee real estate market is moving back in the direction of "normal." Normal appears to be between 400 and 500 home sales per month, and rising over time. Currently, we are seeing the number of homes for sale in Tallahassee rise, but with only 2,000 on the market, our historical normal rate of sales suggests that we can handle 2,400 to 3,000 (six months of supply) and still maintain a balanced market. Regression to the mean suggests that home sales will go up another 35% or so in the coming years, as that is what our market considers "normal." So even as the current buyer activity softens, know that we have plenty of upside left in the Tallahassee real estate market.